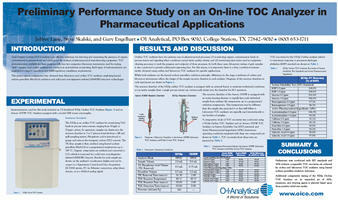 Total Organic Carbon (TOC) analysis is an effective technique for detecting and measuring the presence of organic contaminants in waters used throughout industrial processes, municipal water uses, and for determining residual concentrations of organic material on the surfaces of equipment used in the manufacture of active pharmaceutical ingredients. For these purposes, TOC instrumentation falls into two categories: laboratory instruments used for testing "grab" samples, and on-line analyzers for continuous, near-real-time monitoring. Quality Assurance and Process Control managers employ both technologies to support operations and meet regulatory compliance requirements. Based on wet chemical oxidation, the 9210p On-line TOC Analyzer monitors TOC levels in process streams ranging from 50-ppb to 25-ppm carbon. In operation, the system draws samples into the reaction chamber from a fill and spill sampling system at 3 to 7 minute intervals defined by the user. Acidification of the sample removes the inorganic carbon content. Addition of a persulfate reagent to the TIC-free sample followed by heating to 100ºC oxidizes the organic components. A solid state non-dispersive infrared detector (SSNDIR) measures the resulting CO2. The system then calculates organic carbon content. The 9210p displays results for each sample on the analyzer's touchscreen display. The system can also output data to a Supervisory Control and Data Acquisition (SCADA) system, PC via Ethernet connection, relay/alarm closures, or as a 4-20mA analog signal making the unit well suited for process applications.